How might humans and wilderness co-exist? I want my daughter to know the wilderness outside our cabin, and the wildness within each of us. Last year, I entered the wilderness of fatherhood. When my daughter was 6 months old, my wife, Sarah, and I brought her to a small cabin I built in Colorado’s Rocky Mountains when I was younger. Here on a battered old mining claim, as I built my cabin out of repurposed lumber and sheet metal, I began to question the traditional view of wilderness as something removed from humanity. At a time when so little remains untouched by humans, but when I also hope to raise my daughter among wild things, becoming a father has complicated those ideas. Like a lot of people, I began as a wilderness purist. In the early 1990s, exploring the nearby Fossil Ridge Wilderness, I first read Roderick Nash’s Wilderness and the American Mind, and I advocated, like Nash, for America to continue setting aside designated wilderness. Later, as a trail builder in Washington’s Glacier Peaks Wilderness, I recoiled at William Cronon’s Uncommon Ground: Rethinking the Human Place in Nature, which asks readers to decide “Nature or people?” and argues that “legislating humans out of the wilderness is no solution to our environmental problems.” But over that summer, amid jagged snowcapped peaks, I began to think humans have a place in wilderness. After all, my Pulaski dug trails, my boots were trammeling, and my tent was staked for weeks in places where I was asked to remain a visitor. 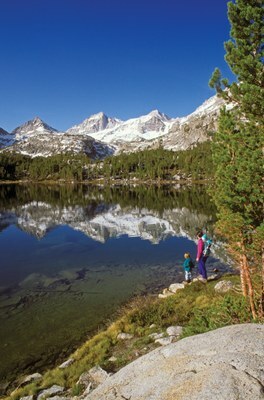 A mother with two young children on the shores of Long Lake in the John Muir Wilderness in California. It has been 25 years since I read Wilderness and the American Mind. I have gone from trail-builder to solitary cabin-dweller to husband and father. Now, as I carry Winter Eve across our spring hillside, I want my daughter to know the wilderness outside our cabin, and the wildness within each of us. And that is why on my cabin’s rough-hewn shelves, Wildness and Raising Wild have found a home beside my Colorado Trail Guidebook, there to teach me to live beside wild lands, to turn toward wildness, in partnership with my wife and our daughter, so that we may learn from her (and our) native self-will. Sean Prentiss is the author of Finding Abbey: a Search for Edward Abbey and His Hidden Desert Grave, which won the 2015 National Outdoor Book Award.